There's nothing much better than spending quality time with the family, and once the most patriotic holiday of the year rolls around, it only amps up the experience. The 4th of July brings out the best in us - and certainly the red, white and blue. This year, prepare to bring your family out to one of the biggest and most anticipated Independence Day events of the year that New York City has to offer. Normally, we tend to wake up early on Independence Day and try to get to the park as soon as possible to get a good spot. It isn't easy to find it, and most of the time we end up losing interest by the time we get a good seat to catch the fireworks. This year, it's time to change the trend. 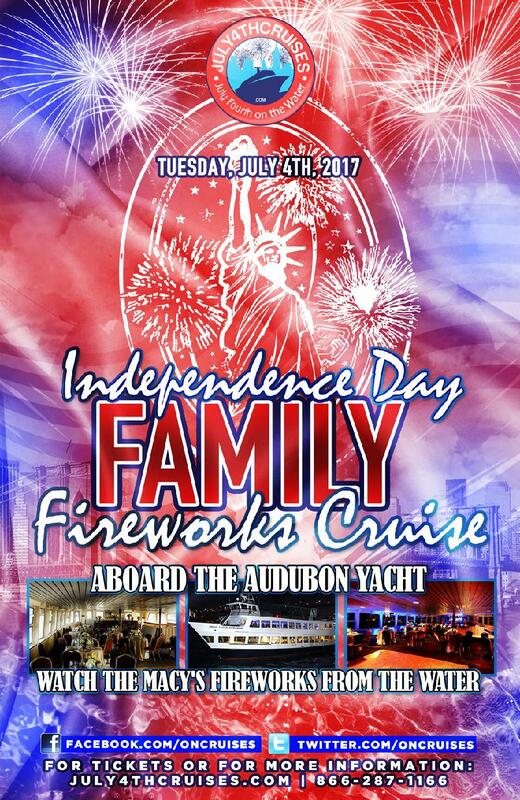 One of New York City's most popular yachts, the Audubon, is getting ready to take off into the blue as their popular and highly anticipated Independence Day Family Cruise is ready for the masses. Presented by July4thCruises.com, this family friendly event for all-ages features an open-bar for the adults, a full buffet to satisfy everyone's hunger, music served up by a live DJ, and the best possible views of the popular Macy's Fireworks Show. You'll be cruised around the city, taking in views of the Statue of Liberty, Governors Island, Ellis Island, and all of the bridges around Manhattan. Expect this to be one phenomenal experience that you definitely will never forget. Make sure you get your tickets while you still can, this event will create some memories that last for years to come!